Named after Polar Singletary, the daughter of a county commissioner, the town maintained a post office from late 1906 until the Spring of 1951. There had been approximately 20 families living in the area and the community had its own school. The Great Depression hit the town hard and as families left, the need for the school was diminished. In time, Polar’s school consolidated with the Jayton district. The population was around 10 when the post office closed with a single business still open in 1951. 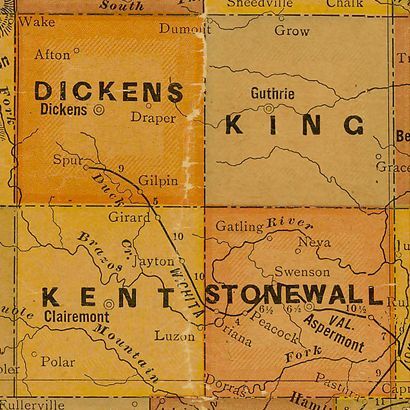 If visiting Polar, Texas, it should be entered from the south through Scurry County since Kent County roads connecting to Polar are unpaved. A cemetery is on the west side of FM 1142 – about 2 miles south of the town. 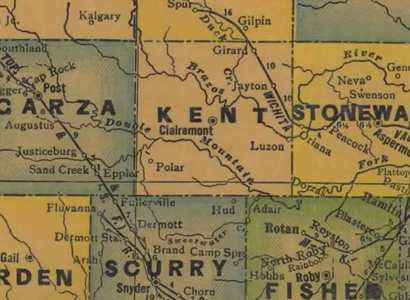 1940s Kent County Map showing Polar (near Garza and Scurry County Line).